Wisdom of Life. : Are you a good dad???? 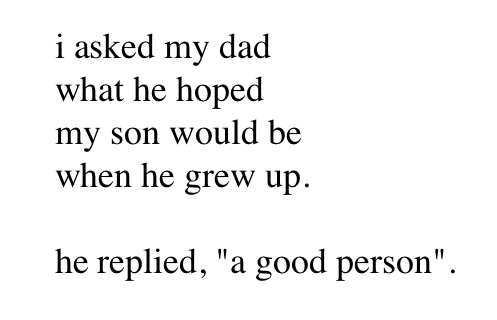 Yesterday was Fathers Day. Though I treat my children more like friend nowadays, they still couldn't forget I'm still the father to my big family. Two of my sons wished me on phone. Exceptionally Alvin being working afar, he sent me a message. He said, "It's Fathers Day, the prefect time to let you know how grateful I am for everything you do. 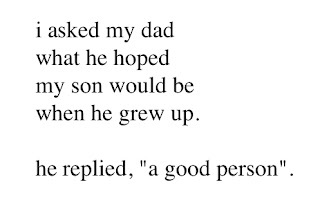 I Love You dad". Meanwhile Chee Ying, my second daughter in law who is a practising lawyer in Singapore also sent me another wishes. She said, "Happy Fathers Day. We are sorry we are unable to celebrate with you today but we want to let you know that you are in our thoughts always. Hope your girlfriends can do a good job by keeping you happy! ;) Thank you for being the best father in law one can ask for". That few asterisks ! ;) she wrote, pondered my mind! A Happy father is to see his children grow. A more Happier father is to know his children getting marry. A most Happiest father is to have his children becoming good father as well. A Successful father is one being naughty as ever and yet his daughters in law still adore and love him much. May I know I qualify all these four?" Alvin replied, "You are more than qualified" & Chee Ying said, "Passed with flying colours". Wow! Their words made my day. I like this quote - "Any man can be a father, but it takes a special person to be a dad".